This working class Homestead house (sometimes called a Temple House after Classical temples) was chosen for our “Architectural Styles Guide” because it so clearly illustrates the style’s roots in the Classical Revival. It is largely in original condition, and features a front-facing gabled roof with cornice returns at the lower end of the flared bargeboards. The symmetrical front facade has a full-width verandah with square chamfered posts and decorative brackets on simple wooden capitals. Originally there was no balustrade as it was at ground level; it now has narrow wooden balusters to comply with modern building code. The house has drop siding and cornerboards representing pilasters. The traditional hip-roofed kitchen, built at the same time and attached to the main house, still exists on the rear. 1892-1950: Leonard Pusey (1864-1954) and his father James Pusey (b. Bucks, ENG, 1830-1893) built the house for Leonard, his wife Clara Montague (née Sexton, b. London, ENG, 1865-1953) and their family. [Note: James came to Canada before 1880. His first wife Ellen died in 1880 and was buried at St. Stephen’s Anglican Church on Mount Newton Cross Rd. 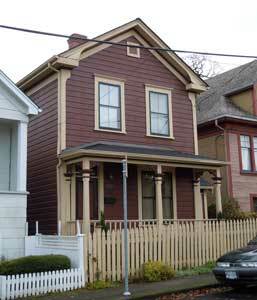 In 1881 James married widow Priscilla Moor, a midwife and nurse who lived in Esquimalt.] James and Leonard farmed in the Sooke and Highlands districts for some time. Clara came to Canada in 1888, married Leonard, and they had 11 children, nine of whom survived infancy. Remarkably the house has only two bedrooms. After moving to Victoria, Leonard worked for the City for many years, as a street superintendent in the 1890s and by 1900, as a city foreman. Leonard Sr. volunteered for the CEF in Feb 1916. He took seven years off his age when he signed his attestation papers in order to qualify, and was put into the Pioneer Brigade. He became ill overseas before he reached the front lines; in October 1916 he was sent to the Military Convalescent Hospital in Esquimalt to recuperate. In the late 1940s the family moved out to Deep Cove. Clara died in Sidney, Leonard in Vancouver. The Puseys’ offspring: Edith Clara married Alvin Charles Falk, a partner in a men’s clothing store. Florence Leona never married and was a photographer for 40 years, retiring in 1951. Leonard Stanley, a pharmacist, married Nancy Leonora Shute; they moved to Butte, MT, then Prescott, AZ. George Montague “Monty” was a tinsmith at BC Sheet Metal Works; in 1915 he joined the 67th Pioneer Battalion for service in WWI, and was wounded in action at Vimy Ridge on April 10, 1917. Monty was killed in 1934 while digging a well on the Saanich Peninsula. He and his partner had dug 26 feet down when part of a blacksmith’s forge fell on his head. Monty managed to climb out of the well and walk 100 yards before he collapsed and died. Dorothy Muriel was a cashier at E.E. Wescott dry goods (1702 Fernwood Rd) before she married clerk Francis Henry “Frank” Lines. Alma Pearl, Dorothy’s twin, died at age one of pneumonia. Marjorie Ellen married mechanic and construction carpenter William Guthrie Fyffe. Ruby Adelaide married house painter John Denney. Percy Raymond died at birth in 1902. BC Telephone employee Sydney Walter “Syd” married Mary “Isabelle” Turner in 1939; they spent their honeymoon bicycling from Victoria to Butte, MT, and back again to visit Syd’s brother Leonard. Norma Minnie, a waitress, moved to Vancouver. 1984 -2012: David Hillman was a conservator at the RBCM until retiring. He restored broken brackets on the front verandah, added storm windows, and applied a historically appropriate colour scheme.